Guest post on the future of dining by Joanne Wilson, Angel Investor, Blogger at Gotham Gal Ventures, Co-Founder of Womens Entrepreneur Festival. The views expressed here are solely those of the author and do not reflect the views of Food+Tech Connect. When did food become a huge part of the new economy? Did it start in urban areas or did it start with the organic farm movement? It’s a movement that began with people driven by a desire for healthy high quality food. They wanted to know where their food came from and that they were not eating processed foods. Is it a knee- jerk reaction to friends and family members getting ill? Is it the desire to live a more healthy live? Or is it just a cycle of change in which people want to return to our original roots of local farming vs. big business? I believe it is a combination of all of these things. That is how movements start and grow. It is not just one thing, but several. I have always been into good eating. I grew up in a kitchen where my mother was an excellent cook and had a coffee grinder and Melita drip coffee maker. Bad food was just not an option. When I got to NYC there was a food movement around California cooking. Jams and Union Square Market were the beginnings of the “new” restaurants in the city. People flocked to them. I can look back now and point to that time where food was really beginning to be a conversation and the green market was an important part of that. Fast forward to 2006: Eater starts to gain an audience. That website changed everything. No restaurant was able to quietly launch and fine tune its menu; People were alreadywaiting for the door to open. To me, that was the beginning of how technology would change the food world. It changed the way we dine. Then others like OpenTable came along. Why call a restaurant when you can book online? And now Resy wants to be the new way to book a last minute table? Will people be willing to pay up for the last minute reservation? Foursquare and Swarm have created apps because it has become important to check into the restaurant of your choice or to search for places to eat by following your friends and seeing their food pictures. It appears that more people are certainly interested in cooking at home and having recipes and ingredients delivered to their home. Blue Apron and Good Eggs are a a few of the companies doing this. Fresh Direct started home delivery almost 10 years ago, and they could easily get into meal kit delivery without having to building the offering out themselves using PlateJoy. And don’t we want to know exactly what we are eating in those packages? Look at how HowGood enables customers to make smart choices about the products they are buying. And we can not forget Food52, which builds communities around recipe sharing and e-commerce with Provisions. And then there is the explosion of new food products. But when did the desire to create new products begin? Food artisans like Ricks Picks started 10 years ago, and there are more and more food startups launching every year. CircleUp saw the opportunity and began a crowdfunding platform for consumer product companies to raise money and expand their businesses. Others like the team behind Smorgasburg saw that food was a way to bring people together to taste, try and buy, too. And Mouth built an online business where you can buy the best indie food products from beef jerky, jams, pickles, cheese, liquors, chocolates and more. Now that I have set the ground work, let’s talk about another way to hack dining: Kitchensurfing. Through the platform you can hire a chef come to your house and make a meal for you and your friends, teach you how to cook with a group or solo, stock your refrigerator with food for the week with information on how to prepare each dish simply or have a chef come a few times a week to cook for the office. 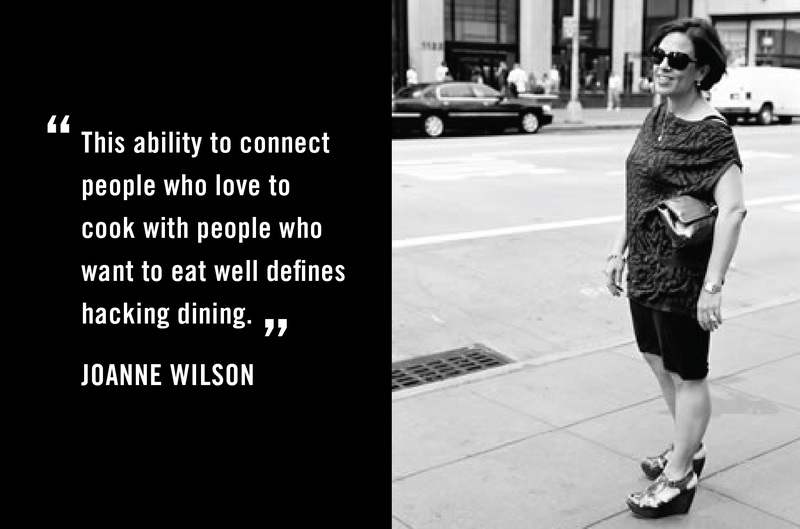 This ability to connect people who love to cook with people who want to eat well defines hacking dining. Have a chef over and tweet it out to the world with pictures of your amazing meal. Now that is where technology meets dining. Joanne Wilson has had many careers. She was a buyer at Macys, ran a company in the rag trade, dabbled in a few friends businesses, spearheaded sales of a start-up magazine/e-zine/events company in Silicon Alley, chaired a non-profit organization focused on technology in inner city schools (that she is still involved with ), sat on our kids school board/exec board for years, sat on a few other profit and non-profit boards and she continues to be involved with start-ups by investing money and time. She has been involved with more real estate transactions (from beginning to end) than she cares to mention. She is involved with politics too but tries to keep it on the down low.